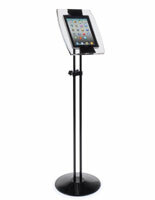 Compose arrangements and rehearse tunes using your tablet and an iPad music stand. Whether you're a violinist reading sheet music, a guitarist playing a chord progession or a vocalist learning lyrics, you'll find these tablet holders secure your device while offering flexibility and mobility. iPads and other digital tablet devices are commonly being used across the entire music industry, and tablet music applications allow us to do everything from read sheet music/lyrics, mix sound, run loops, tune instruments and even run your light show rig! The only thing they can't do is stand at an eye level by themselves, which is where these ipad music stand holders come into play. 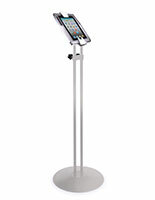 Many of these iPad stands for musicians are height-adjustable, allowing the screen to be viewable from either a sitting or standing position. 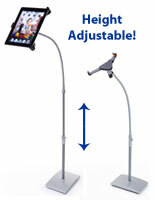 Choose a stand with a perpendicular adjustable arm or articulating bracket, and rotate the tablet to either a portrait or landscape position depending on your preference. 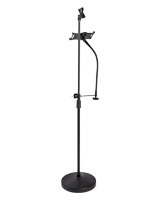 Browse stands with a tilting bracket for easy pivoting and adjustment mid-set or mid-symphony. If you're concerned about theft at a busy nightclub or festival, choose a stand with a kensington lock kit that secures the iPad for safekeeping. 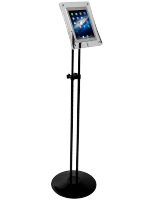 If mobility is a concern, make sure to pick an iPad music stand that is easily compactable and effortlessly lifted up to a stage or carried into the studio. 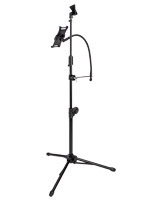 These stands will help you nail that next audition for the session, flawlessy execute that musical score you've been working on, or help you memorize the lyrics to that long R.E.M. song. 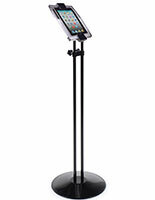 Check these out, and don't forget to round out your purchase with our huge selection of tablet stands and accessories.